With the rabi crops almost ready for harvest, the farms in Maharashtra have little else to offer in February. The moisture in the soil dries up, and new vegetables stop growing. Wadis, or large kitchen gardens, where some of the traditional vegetables are grown, also become barren. While farming households get busy drying the harvest in the sun, there is little variety in food to tickle the taste buds. This gap in the food cycle, roughly from February to March, is the time when heti flowers (Sesbania grandiflora) bloom. Relished as a seasonal delicacy, these soft white blossoms, with occasional pinkish streaks, provide brief succour from the monotony of dal and dried foods. Heti, which is in full bloom for almost a month, is most widely eaten in the Konkan area of Maharashtra, where it is known as hadga. 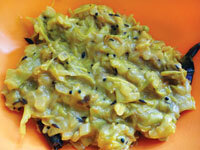 It is also relished in the Vidarbha and Marathwada regions of the state. I do not find its taste particularly striking. Heti does not have a strong flavour, hence ingredients such as besan and curd are used to enhance its taste. Its beans are also cooked. Heti offers variety in cooking, though. It can be eaten as stir-fried bhaji, cooked in a tangy style with besan and tomatoes or curd, or as crispy pakoras with gram or rice flour. Heti tree has healing properties as well. Karuna Futane, a farmer in Rawala village in Amrawati district, who showed this Down To Earth reporter how to prepare the above dishes, says that the leaves, flowers and beans have been traditionally used to cure asthma, cough and cold. Pradeep Saudagar, researcher on traditional food with the Gadchiroli-based non-profit Amhi Amachya Arogyasathi, says that in his native Buldhana district, a paste of the bark and leaves is consumed by women to cure leucorrhoea. The flower is also known to be a coolant. In southern India, its tender leaves are used in soup during the scorching summer months. Heti flowers are also one of the richest sources of Vitamin A. Ayurveda attributes a host of curative properties to this flower, ranging from curing fever and sinus to anaemia and tumours to even rheumatism, arthritis and venereal diseases, according to a paper published in the International Journal of Drug Development and Research in October 2011. 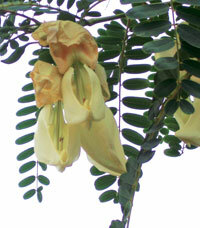 The paper says that heti flower is also used to cure eye infections, headaches, small pox and stomatitis. In modern times, heti trees are growing rare. “Earlier, a tree or two was an essential part of a farm or backyard,” says Saudagar. “But in recent years, cash crops and growing need for residential land have drastically brought down the number of trees.” From being a regular on people’s plates for at least one month of the year, heti flowers have now become an occasional delicacy, he adds. Wash and chop the flowers. Petals need not be separated. In a pan, heat the oil, add the mustard seeds, red chillies and cumin seeds. When the chillies are well roasted, add the chopped onion and garlic flakes. Cook till soft. Add the flowers, salt and turmeric. Stir and cook till almost done. Make a thick solution of the curd and gram flour and add to the flowers. Add water. Mix well and bring to boil. If you are using tomatoes, add the chopped tomato to the cooked flowers. Sprinkle dry gram flour, add water and mix well for a smooth consistency. Simmer for a few minutes. Serve with rice or roti. For stir fry, follow the same steps as above, but cook without adding the curd, tomatoes or gram flour.